Back in 1996 there was a film released starring David Bowie called “The Man who fell to Earth”. 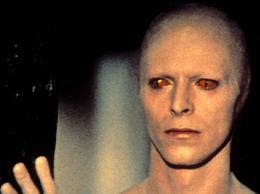 Bowie played the part of Thomas Jerome Newton who was a humanoid alien who came to Earth to get water for his dying planet. He starts a high technology company to get the billions of dollars he needs to build a return spacecraft, and meets Mary-Lou, a girl who falls in love with him [obviously!]. He does not count on the greed and ruthlessness of business here on Earth, however. But that was just a film … it wasn’t real … but could it be? Fast forward 16 years and this weekend we saw Austrian Skydiver Felix Baumgartner become the first man to literally fall to earth by jumping out of a balloon 128,100ft (24 miles; 39km) above New Mexico. This somewhat lunatic activity making him the first skydiver to go faster than the speed of sound, reaching a maximum velocity of 833.9mph and also smashing the record for the highest ever freefall. In addition, another record has reportedly been broken. 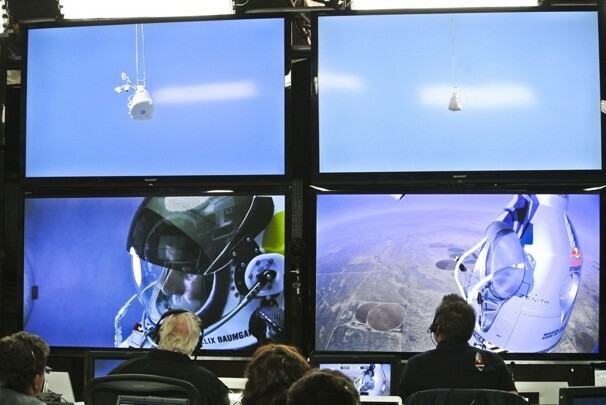 Unofficial figures show that the live stream of Baumgartner’s jump received over 7.1 million views surpassing the 500,000 YouTube live stream views record for the London Summer Olympics. But why would he want to do this? At Sunday’s jump altitude, the air pressure is less than 2% of what it is at sea level, and it is impossible to breathe without an oxygen supply. Others who have tried to break the records have lost their lives in the process. Well the researchers on the Red Bull Stratos project say it has already provided invaluable data for the development of high-performance, high-altitude parachute systems, and that the lessons learned will inform the development of new ideas for emergency evacuation from vehicles, such as spacecraft, passing through the stratosphere and indeed NASA and its spacecraft manufacturers have asked to be kept informed. He says he is motivated in part by scientific endeavour, the desire to see what the human body can achieve. But Baumgartner is also spurred on by the desire to see what no-one else has seen, to be alone at the highest reaches of the skies. He has built up to this latest stunt by undertaking various other dangerous activities such as in 1999 when he set the world record for the highest parachute jump from a building when he jumped from the Petronas Towers in a Kuala Lumpur, Malaysia. The twin skyscrapers were the tallest buildings in the world at the time, only overtaken by the Taipei 101 in 2004. Naturally, in 2007, he also jumped off the Taipei 101. He then went to the opposite end of the scale, completing the world’s lowest ever base jump from the 30m-high arm of the Christ the Redeemer statue in Rio de Janeiro. He followed this in 2003 by becoming the first person to literally fly across the English Channel. Using a pair of specially made carbon fibre wings, Baumgartner leapt from a plane above Dover, landing 22 miles (35km) away in Cap Blanc-Nez near Calais just 14 minutes later. I can’t help but worry about what he might do next, and will it be the last thing he ever does. It would appear that his need for danger is addictive and each time he does something it is bigger and more dangerous than the last. I just hope that this doesn’t end up as life imitating art. After all, throughout the film of “The Man who fell to Earth” there are brief sequences of Newton’s wife and children back on his home planet, slowly dying, and by the end of the film they are dead and Newton is stuck on Earth, broken, alcoholic, and alone. 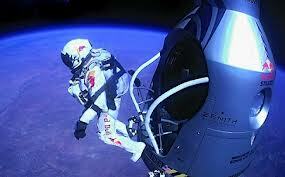 This time Red Bull “gave him wings”. I just hope they are still there to help him fly the next time, whatever or whenever that might be! Posted on October 15, 2012, in General, London2012, Space, Trivia and tagged 1996, Austrian, Calais, Cap Blanc-Nez, Christ the Redeemer, David Bowie, Dover, English Channel, Felix Baumgartner, freefall, Kaula Lumpar, Mary-Lou, NASA, New Mexico, Petronas Towers, Red Bull, Rio de Janeiro, science, skydiver, Stratos, Taipei 101, Thomas Jerome Newton. Bookmark the permalink. Leave a comment.